Dynamic Class Referencing (DCR) is a pattern that enables you to avoid hard-coding of class names, flow names, and workbasket names so that the implementation layers can easily extend the application. Pega Customer Service implemented the DCR approach using data page and data transforms. The approach helps a specialized layer that is built on the horizontal layer to Save-As the data transform rules in the specialized layer ruleset to update the class names, flow names, and update or add additional property mappings. The approach dynamically sets the specialized layer class names, flow names, and any other values to the appropriate clipboard pages at run time. Log in to the Pega Customer Service Specialized application. Search and open the Declare_CAApplicationSettings data page. In the Save list, click Specialize by class or ruleset to copy the data page into your implementation layer ruleset. Label – The name and description of class or implementation class. Apply to – The class in the specialized layer extended class, for example, PegaCA-Admin-ApplicationSetting. Enter the field details based on your configuration settings. Enter a specialized class name that inherits from PegaCA-Admin-ApplicationSetting in the Object type field. As a best practice, you can create a new class extending from PegaCA-Admin-ApplicationSetting in the implementation layer and configure Data Transform in the implementation layer with only required properties to easily consume Pega Customer Service layer settings coming in future releases. From the Source list, click Data Transform. Enter Applicationsettings in the Data transform name field. Click Open rule in Designer Studio to open the data transform rule. Refer to the following application configuration settings table to update the properties based on your implementation layer settings. If you are upgrading from earlier versions of Pega Customer Service, configure the following properties in the Applicationsettings data transform from values in the CAApplicationSettings Map value rule in the implementation Layer. Controls the default tab that displays when the search interaction and service items are selected from the composite. Set the value as Service Items to make the Service item tab the default search tab. Set the value as Interaction Items to make the Interaction tab the default search tab. Supported in legacy portals only. Set the value as true to refresh the user worklist on the dashboard whenever they return to their dashboard if they have completed an interaction or work item/case. Determines whether users are allowed to open multiple instances of the same service process during an interaction. Select true to allow CSR to launch the same service process in parallel. 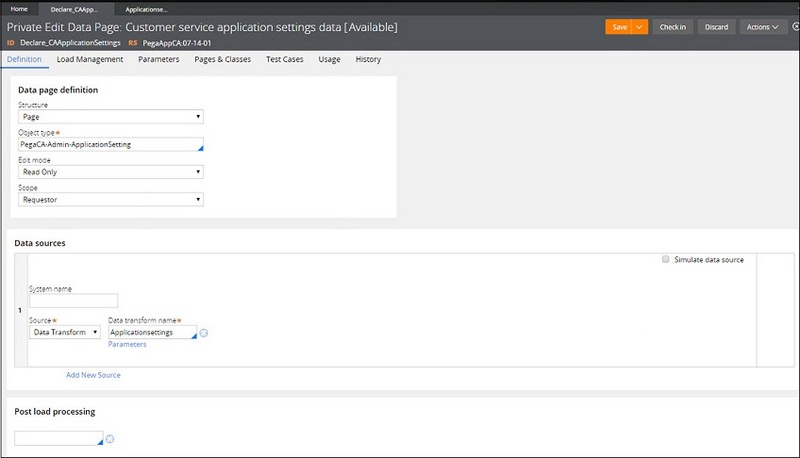 For example, opening 3 of the same service processes at the same time during an interaction. Pega Customer Service Default To Report Browser? Set the option as true to display the Report Browser in the Pega Customer Service Interaction Portal, and the Pega Customer Service Account Manager Portal. When the option is set to false, the Analytics tab displays in the above portals. Set the option as true to allow Sections in the Interaction Driver to automatically refresh with certain UI events so the Sections remain “in-context” with the current process. This setting supports backward compatibility to existing flows that call the CAAddHeaderTask and CALogWorkObject. Set to false to enable backward compatibility. The CPMInterfaceLayerSettings Data Transform is used to configure interface classes. It is recommended that implementation users update this Data Transform with implementation layer interface/Data layer classes. Select the Call superclass data transform check box. The existing application is configured to use DCR. Starting in Pega Customer Service 7.1.4, the CAApplicationSettings Map value is deprecated and should not be used.